Photo courtesy of McDaniel College Office of Communications and Marketing. 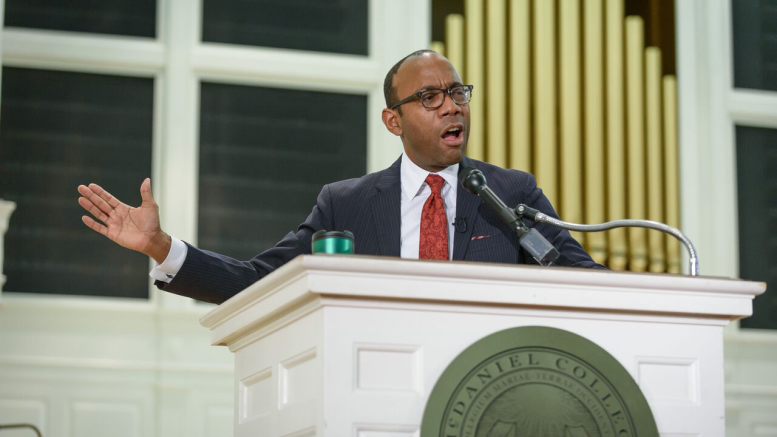 On Oct. 24, the President and CEO of the NAACP, Cornell William Brooks, gave a riveting talk at McDaniel that tackled many issues we are seeing in today’s society, from racial inequality, to economic and social inequality, to voter suppression. “Do not tell me what students and young people can’t do,” he claimed. Throughout his speech, Brooks pushed for as inter-racial, inter-faith, inter-generational, all-encompassing movement for justice, a movement that starts with students. It was students that helped the Civil Rights Act of 1964 get passed. It was students that started the Black Lives Matter movement. Today people face more and more issues of social justice, issues that are rooted in institutionalized racism. “This is a post-millennium civil rights movement that encompasses the movement for black lives but also encompasses the movement to reform the criminal justice system, to reform the voting system, to deal with economic inequality, income inequality, and income variability,” Brooks stated. The movement we see today tackles issues of environmental racism, the Flint Water Crisis, voter suppression, and others. The NAACP president emphasized the importance of voting in his speech and said,“The right to vote is a civic sacrament.” Brooks explained that it was students that helped pass the “Ban the Box” law in New Jersey. This law is meant to create a second chance for those who never had a first. These people are those that are profiled, those that are shot at when they pose no danger, those that have been ignored by the government. Brooks also mentioned a recent Supreme Court decision called Shelby v. Holder, in which Supreme Court justices gutted the Voting Rights Act. Through this decision, states have been able to pass legislation making voting much more difficult. One state that he mentioned was Texas, where a concealed weapons ID is sufficient identification to vote, but a student ID from university is not. “In other words, a concealed weapon permit allows you to vote, but your McDaniel ID does not allow you to vote in Texas,” he stated.